The ZT values of bulk thermoelectrics has typically hovered around 1, especially for bulk materials. In the recent years, there has been success in enhancing ZT, especially for thin film structures using an "electron-crystal, phonon-glass" approach  wherein nanostructures are introduced to reduce thermal conductivity without affect electrical conductivity. However, this achievement is challenging in bulk materials which are needed for large-scale generation of electric power from waste heat. Additional challenges have been faced with the deteriorating properties at high temperatures, stability of the structures at operating conditions, use of toxic materials such as Pb, Te, Se etc, and mechanical robustness. Oxides are well suited for high-temperature operation with since their ZT increases even at temperatures of about 1000 K. Also, oxides exhibit excellent stability at high temperatures. Furthermore, thermoelectric oxides do not include Pb, Te, Se etc and can be processed in air instead of sealed quartz tube conditions. The challenge with oxide thermoelectric materials so far has been the relatively lower figures of merit compared to chalcogenides, skutterudites, and clatharates. Since oxide thermoelectrics are highly anisotropic, electrical conductivity along the basal plane is about two orders of magnitude higher than that perpendicular to the plane [2, 3]. 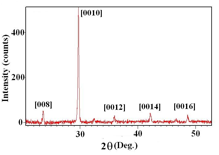 In another study, the resistivity along the basal plane of NaxCoO2-d single crystals was found to be an order of magnitude lower than that in polycrystalline bulk ceramic samples . However, the thermal conductivity of single crystals has not been reduced due to the lack of phonon scattering defects such as grain boundaries, second-phase precipitates, and dislocations. The thermal conductivity of single crystal NaxCoO2-d is 2.4 times higher than that of NaxCoO2-d polycrystals . If its thermal conductivity can be reduced to the level of polycrystalline material, then the ZT at 800 K would be nearly three. Bulk sintered materials with fine grains and nano-scale secondary phases have exhibited lower thermal conductivity, but have displayed lower electrical conductivity because of random grain orientation and the prevalence of grain boundaries. The main hypothesis of our approach is that a microstructure that can be created with an excellent grain alignment of anisotropic thermoelectric oxides along with fine-scale defects such as precipitates, dislocations, and stacking faults will meet the conflicting performance requirements in thermoelectrics and lead to the elusive high figure of merit at high temperatures. A top-seeded melt-texturing technique, previously developed for oxide superconductors, is the process we are exploring to introduce long-range grain alignment [5, 6]. This technique is schematically shown in Figure 1, where a sintered thermoelectric oxide is subjected to partial melting with a short excursion in temperature above its melting point. A single crystalline or a melt-textured seed of a material with a melting point above this temperature, and with a same crystallographic structure, and lattice parameters close to that of the thermoelectric oxide is used. Nucleation is initiated from the top of the partially-melted thermoelectric sample as it is cooled down to the vicinity of its solidification temperature. 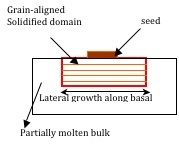 By slow cooling through the solidification temperature or holding at an undercooled temperature, growth of crystallites with grains aligned along the basal plane proceeds laterally and vertically with an epitaxial relationship from the seed. Essentially, the crystallographic orientation of the seed material is reproduced from a size of a few millimeters to about 10 cm in the bulk oxide. Since the basal planes of the melt-textured material could be aligned over the entire bulk, a high electrical conductivity is expected, which is important for high ZT. Figure 1. Melt-textured growth process being explored to fabricate grain-aligned bulk thermoelectric oxides. Also included in a top view of a melt-textured superconductor showing a planar growth front of a single solidified domain. Melt-textured growth also provides pathways to create nano-scale defects such as precipitates, sub grainboundaries, dislocations, and stacking faults which could all lower thermal conductivity through phonon scattering in thermoelectrics just like it dramatically improved critical current performance in bulk superconductors through fluxon trapping . Based on studies of published phase diagrams, we are working on appropriate thermoelectric oxide materials and compositions that can result in precipitation of fine-scale secondary phases during the slow cooling process employed in melt-textured growth (Figure 2). For example, as shown in Figure 2, peritectic decomposition of incongruent melting materials such as CaMnO3 results in formation of Ca4Mn3O10 and liquid, which upon melt-textured growth could lead to Ca4Mn3O10 precipitates embedded in a grain-aligned matrix of CaMnO3. Our initial melt-texturing experiments with thermoelectric Bi2Sr2Co2Ox and 2%Nb:CaMnO3 show grain-aligned microstructures and good (00l) texture from X-ray Diffraction measurements (see Figure 3). Details can be found in reference 8. Figure 3. Texture and microstructure data obtained from experiments of melt-textured thermoelectric Bi2Sr2Co2Ox. and 2%Nb:CaMnO3. G.A. Slack, "New materials and performance limits for thermoelectric cooling", in CRC Handbook of Thermoelectrics, ed. by D.M. Rowe, CRC Press, Boca Raton, FL, 1995, p. 407. V. Selvamanickam, D. Kirchoff, C. E. Oberly, K. Salama, Y. Zhang, and S. Salib, in High Temperature Superconductors : Synthesis, Processing, and Applications, ed. U. Balachandran and P. J. McGinn, TMS, Warrendale, 1997, p. 117. V. Selvamanickam and B. Zhang, “Melt-Textured Growth of Grain Aligned Bulk Oxide Thermoelectrics” in Mater. Res. Soc. Symp. Proc. Materials and Devices for Thermal-to-Electric Energy Conversion ed. J. Yang, G.S. Nolas, K. Koumoto, Y. Grin 1166-N09-07 (2009).